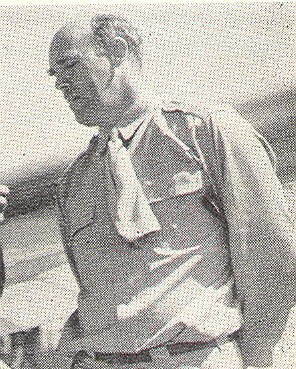 Parker Leonard was President of SSA from 1941 to 1946, and served as editor of Soaring magazine during part of that period. His efforts during the years of World War II helped enable the Society to continue and become the viable organization it is today. Parker was present at the early soaring expedition to Cape Cod in 1929. He watched flights of a German primary, built his own replica, and proceeded with friends to make hundreds of soaring flights there. Later, with a partner, he acquired a higher performance German glider, the Walt, and finally built and flew a large two-place sailplane. His interest was always related more to sailplanes for general use than to "ultimate" contest ships, and his last article in Soaring (Nov-Dec 1944) was titled "A One-Design Contest Sailplane." The glider he proposed in that article is surprisingly like the 1-26, if one allows for the fact that his large 220-pound size dictated a slightly larger vehicle than what was eventually commercially produced. At the beginning of WW II, he was called to Harris Hill, Elmira, to instruct the first Army trainees who were later to operate the big CG-4A troop carrying gliders. For a short period he worked with Hawley Bowlus in California on military glider developments and in 1942 aided in the design and construction of the Pratt-Read two-place training sailplane in Connecticut. Among his co-workers on various aeronautical developments were Dr. Gus Raspet, Vic Saudek, and Henry Struck. Since Struck was a champion modeler and thanks to Paul MacCready's interest in model airplane flying, Paul got to know his future father-in-law, Parker Leonard. But before that, Parker and Henry took Paul to Elmira one weekend where John Robinson gave him his first sailplane ride in a in a TG-3. The excitement of soaring (and the dynamic and friendly people associated with it) infected Paul, and then he, Parker and Vic Saudek bought a surplus Pratt-Read in the fall of 1945. Parker trained Paul for his soaring license and then Paul flew the P-R in the 1946 Elmira Nationals. Parker Leonard's daughter, Judith, and Paul MacCready were married in 1957. In Fall 1972 Parker attended the Old Timers Symposium at the National Soaring Museum - perhaps realizing that his failing health might make it a last occasion to revisit his soaring memories from decades ago. Paul Schweizer arranged a flight for him in the school 's Schweizer 2-32. One day during his last visit to the west seemed to have special significance and enjoyment for him. With with his daughter and son-in-law, Paul MacCready, and his grandchildren, they drove to Crystalaire, where Parker Leonard watched the soaring activities and had his first close-up view of the new super fiberglass ships which had evolved from the simple aircraft he had first flown at the Cape Cod sand dunes. Later the group saw the Cinerama movie whose last scene is a dramatic flight over mountains and among towering thunderstorms - the closest a movie can come to the ultimate thrill and majesty of soaring. Leonard's life was varied, full, and happy. He gave much to soaring and received much in return. Parker Leonard received Silver # 24 in 1939. His ?C? badge was #196, date unknown. 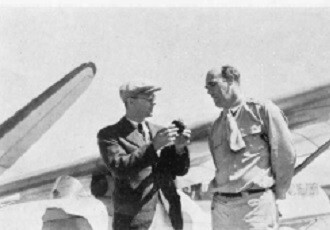 Wolf Hirth and Parker Leonard in conversation during the 1939 Soaring Contest at Harris Hill. Loomis photo.